After the jump, Red Bull Arena revealed and 16 photos! Back in January it was announced that the New York Red Bulls will have to wait until 2010 to open their new stadium in Harrison, N.J. and that there is no way the soccer-specific facility will be done in time for games during the 2009 Major League Soccer season. What’s the hold up? Construction delays, government red tape, little progress on the development of other parts of the area, basically all the things that Red Bulls fans have long had to endure while waiting for their team’s new home. On Tuesday, April 14, 2009 construction workers and guests watched on as the last structural steel beam was put in place on the new New York Red Bulls soccer stadium in Harrison during the topping-off ceremony. 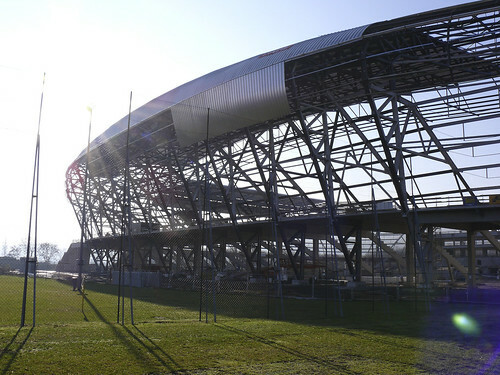 • It cost somewhere between $180–$200 million to construct and will seat 25,189 people. • The stadium will sit alongside the Passaic River with a view of the Newark, New Jersey skyline to the west, and New York City and Jersey City further off in a distance to the east. • The stadium will be accessible via public transportation at the PATH train stop at Harrison. • The new design features a roof extending just past the field’s touchlines with 60 feet of the roof being transparent to allow for natural light. • All Seats Covered: All seating is covered from inclement weather. • The first row of seating is to be approximately 21 feet (6.4 m) from the touchlines.